A healthy diet and regular exercise may top the list of wellness essentials, however the body’s largest organ—the skin—also needs daily attention with the right products to get glowing. Natural is the new beauty buzzword — a growing trend towards nature-based skincare, inspiring many to toss out toxin-laden in favour of mostly chemical-free. Why? What we put on our skin has been found to go within. From parabens to sulfates, petrochemicals to synthetic fragrances, when applied to the skin these are known to directly enter the bloodstream, potentially causing ill effects on the body. While selecting good-for-you ingredients is a step in the right direction, choosing nature-derived, skin-nourishing formulas that have proven results is key. One of the most renowned natural topical and internal beauty ingredients is silica. An essential mineral for healthy skin and bones, as well as connective tissue, the body’s silica stores deplete as you age. Supporting your intake of this nutrient through diet, supplementation and topical skin products encourages healthy growth and functioning of skin, as well as hair, nails and connective tissue. 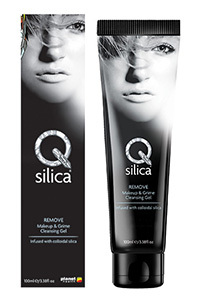 Naturally found in quartz crystal, silica is a natural daily support for skin elasticity and smoothness that gives you a fresh, youthful glow. 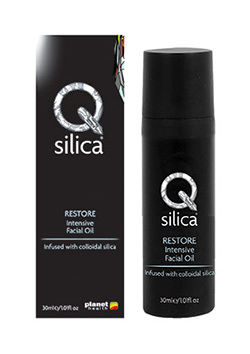 With an inside and out approach to beauty, it’s this hero ingredient that is the foundation of one of Australia’s own award-winning, nature-based skincare and vitamin supplement brands – Qsilica. 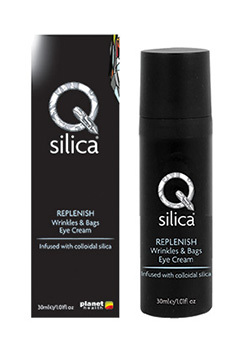 All Qsilica skincare and supplements are Australian made from premium ingredients sourced globally. Each is vegetarian-friendly, with no animal ingredients or animal testing. The range does not contain parabens, sulphates, petrochemicals, artificial colours or synthetic fragrances. This all-natural multipurpose balm deeply nourishes, soothes and conditions dry skin and moisturises chapped lips. 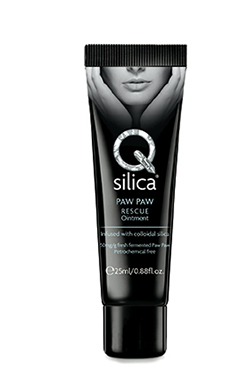 Qsilica PAW PAW RESCUE Ointmentcombines fermented Paw Paw extract in a soothing base that includes mineral silica, shea butter, beeswax, macadamia oil, and calendula extract. This rich, hydrating balm protects and seals in moisture and uses only 100 percent naturally derived ingredients without the addition of petrochemicals, parabens, or artificial colours or fragrances. Winner ‘Skin Saviour Award’ at the UK’s Janey Loves 2015 Platinum Awards and voted ‘Best Lip Balm’ at the UK’s Beauty Shortlist 2014 Awards. 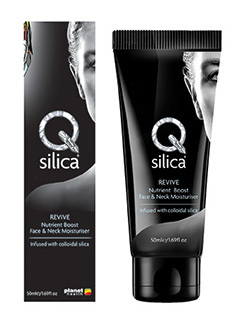 Qsilica RENEW Stimulating Facial Masque can help your skin look and feel younger, smoother and firmer, reducing the physical signs of ageing, such as age lines and wrinkles. Use it to stimulate and rejuvenate any area of you skin, not just your face. This foaming cleansing gel uses natural sugar and coconut extracts to gently remove impurities, while jojoba seed oil helps remove excess oils to balance the skin’s natural oil production. REMOVE Makeup & Grime Cleansing Gelhelps the skin to feel fresh and toned, ready for moisturising. Winner of ‘Best Cleanser’ in the Nature and Health Natural Beauty Awards 2015, and Voted ‘Overall Winner’ in the UK’s FreeFrom Skin Care Awards 2012. For skin that needs a more intensive clean, this smoothing facial exfoliator removes dead skin cells without irritation. Fine particles of ground bamboo are evenly dispersed in a luxuriously creamy base. With the power of salicylic acid to remove dead skin cells, Vitamin B5 to enhance the regeneration of new skin cells and shea butter to maintain elasticity and moisture, the facial exfoliator will leave skin feeling soft and smooth. REVITALISE Soothing Facial Exfoliatoris suitable for all skin types especially skin with clogged pores and dull, tired complexions. Commended in the FreeFrom Skin Care Awards 2014. An everyday essential for day-long hydration, the facial moisturiser delivers nutrients to boost skin radiance and vitality. Natural Vitamin A (from coconut) gently clarifies and protects the skin. Vitamin E from sunflower oil and macadamia oil, provides antioxidants and restores the skin’s moisture levels while reducing the appearance of facial lines and wrinkles. The mineral silica inREVIVE Nutrient Boost Face & Neck Moisturiser leaves skin silky smooth and gives the appearance of naturally glowing skin. Rich and deeply hydrating with a luxurious creamy texture, REPLENISH Wrinkles and Bags Eye Cream is perfect for encouraging smooth and supple skin around the delicate eye area. Sea buckthorn and cucumber oil work to reduce puffiness and bags while delivering natural phytosterols and Vitamin C to nourish and stimulate skin cells. Avocado oil is rich in lecithin and plant sterols to deliver a high dose of vitamins and repair and protect the skin. In combination with the mineral Silica, the cream gives eyes a fresh, rejuvenated and youthful look. Voted ‘Best Eye Product’ in the UK’s Janey Loves 2014 Platinum Awards. Combining natural oils selected for concentrated skin therapy,RESTORE Intensive Facial Oil restores radiance to tired, dull skin. Sweet almond oil easily penetrates to restore moisture immediately, Rosehip oil delivers essential fatty acids, vitamins and nutrients to help repair and improve the skin’s texture and help smooth wrinkles and fine lines. Vitamins A, E and Coenzyme Q10 are used for their ability to promote smooth skin, visibly fight the signs of ageing, reduce the appearance of UV damage and stimulate healthy collagen production. The goodness of the intensive facial oil penetrates your skin and in combination with silica, promotes youthful and radiant looking skin. With the goodness of avocado oil, macadamia oil, shea butter and Vitamin E, all-natural REJUVENATE Invigorating Body Lotion moisturises and nourishes. Promoting elasticity, suppleness and hydration, the lotion delivers vitamins, essential fatty acids and the mineral silica to give skin a natural glow. The delicate fragrance of lime, lavender and sandalwood refreshes and invigorates. Vitamin E, avocado oil and macadamia oil drench hands with rich, velvety goodness to instantly smooth fine lines, deliver effective hydration and help protect against moisture loss. Cocoa seed oil adds deep, aromatic chocolatey notes while moisturising the skin. 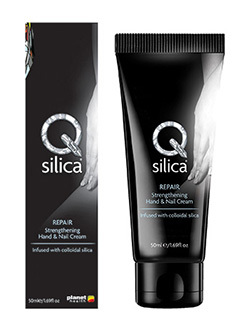 REPAIR Strengthening Hand & Nail Creamis infused with colloidal silica and leaves hands feeling silky and smooth. 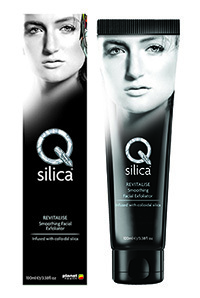 Qsilica is also known for its premium, Australian-made internal vitamin supplements featuring natural beauty mineral colloidal silica. Used with the brand’s skincare range, these help to support healthy and radiant, younger-looking skin from the inside and out. Find out more here.